The presentation begins with NIRGEET, a research – based work which attempts to showcase the rich and varied dance vocabulary of the ancient period and to search its roots in Bharata’s Natyashastra. A ritual performed around 2000 years ago by musicians and performers as a preparation seeking to please the gods, pacify the demons and sanctify the performance space, NIRGEET comprised abstract utterances, melodic and rhythmic patterns coupled with symbolic gestures and motifs thus consecrating both space and time. 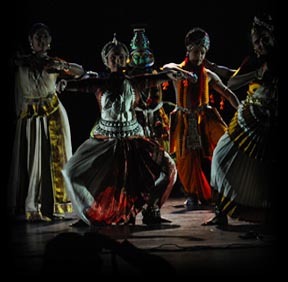 These abstract utterances of Nirgeet set to time cycles of 7 beats and 4 beats showcasing the movement–language of the 7 dance forms are followed by an intricate piece in 5 beats evoking the imagination of Shiva’s dance. Nirgeet culminates with SAGEET – meaningful verses in praise of Lord Shiva – the deity of the performance space; thus evoking the inspiration in the performer to commence the performance that can transcend the physical, metaphysical and cerebral.